The Mission Dining Room Set has a rich cultural heritage as some of the first pieces of this genre where used in the southern Spanish missions. It is handcrafted from solid quarter sawn oak which gives it its unique grain pattern but is also available in regular Oak, maple and cherry. 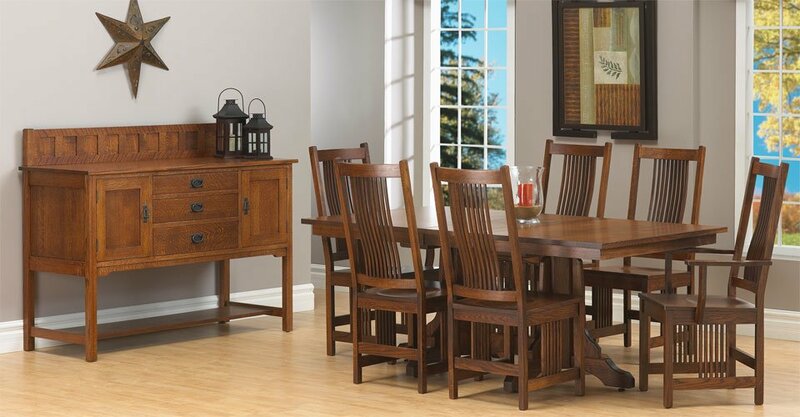 The sturdy yet stylish chairs sit comfortably contoured to fit your natural back posture and whether it is paired with a sideboard or a hutch this set will be sure to stun your guests. Available widths: 36, 42, 48, 54, 60 Inches and Available lengths 60, 72, 84, 96 Inches with with 1-2 12" with 1-8 12" ext. The sideboard and pantry comes with your choice of hardware.